Dawes is the most unassuming popular rock band out there these days and it’s refreshing. Frontman Taylor Goldsmith downplays being considered by some as one of the top songwriters of his generation, even downplaying his own guitar ability at the same time as playing up the ability of his band mates. It’s admirable, and one of the reasons Dawes is still on a steady rise in popularity. They’re more likely to be found reading a book or relaxing than partying after a show and they aren’t ever shy about being the opening band. Dawes is at a level where they could consistently headline, but they enjoy playing the role of opener and the potential to make new fans. It was exactly a year ago today (May 4) that they warmed up a Charleston crowd for Bob Dylan on his headlining tour. 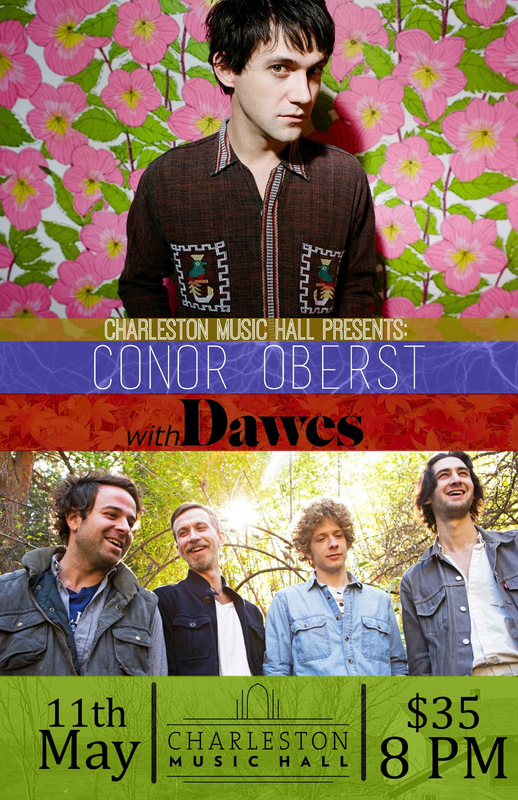 This time they’ll be returning to Charleston for a more intimate show at Charleston Music Hall both opening for Conor Oberst and serving as his back-up band. It might sound strange the first time you hear it, but it’s rather common for Dawes. They’ve served as backing band over the years for Jackson Browne, The Band’s Robbie Robertson, and even John Fogerty when he played “The Late Show with David Letterman”. In 2012 they brought Johnny Corndawg Fritz out to California for a recording session at Jackson Browne’s Santa Monica studio where they served as his backing band for his album Dad Country, in addition to some co-writing. Add in co-writes with Robert Ellis and it’s hard to understand how they keep up. Labeled (mislabeled) a Laurel Canyon rock band, mostly for their influences such as Jackson Browne, James Taylor, Crosby, Stills and Nash to name a few, Dawes recorded their last album across the country from their California home in Asheville, NC at Echo Mountain Recording Studios. That album, Stories Don’t End, is the album they’re currently touring on and one that’s seen success with strong radio play for lead single “Most People”. To support their tour together Dawes and Conor Oberst released a split 7″ on Record Store Day which features them covering each other’s songs. Conor Oberst has been silent since the 2011 release of Bright Eye’s album The People’s Key, but that’s all about to change. Over the past 3 years, the now 34-year-old has been more focused on his 2010 marriage and writing a sci-fi screenplay for his supergroup Monsters of Folk that’s unlikely to ever see the light of day. Oberst’s new album Upside Down Mountain drops May 20 and his popularity looks to hit new heights. After vowing off major record labels early in his career, Oberst had a change of heart, signing with Nonesuch (Wilco, The Black Keys), a subsidiary of Warner Music Group which hosts a juggernaut of a promotional platform. The new album, which he’ll be performing much of at the upcoming Charleston show, swings back towards Oberst’s rootsy folk and smooth country side unlike the manic 2011 album The People’s Key. This show is combines two of the most gifted narrative songwriters of their generation. Those have been the words of many other writers over the years, and as time passes by, those words become more and more true. Tickets for you a guest to the show May 11 at Charleston Music Hall courtesy of NS2.